New research details biological difficulties in mammalian reproduction and development in space. Teruhiko Wakayama and his colleagues at the RIKEN Center for Developmental Biology in Kobe used a 3D clinostat to conduct experiments with mouse sperm and ova in a microgravity environment. 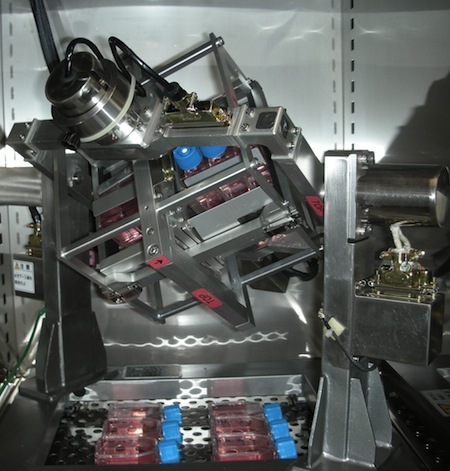 The 3D clinostat apparatus uses rotation in all three dimensions to enable cell culture experiments under conditions that recreate zero-gravity. This allows research on the earliest stages of embryonic development in an environment that simulates space travel. This finding casts into doubt the science fictional notion that human beings can survive in zero gravity or in the microgravity environment of large asteroids (Belters, I'm talking to you!). From Riken Research via Medgadget.